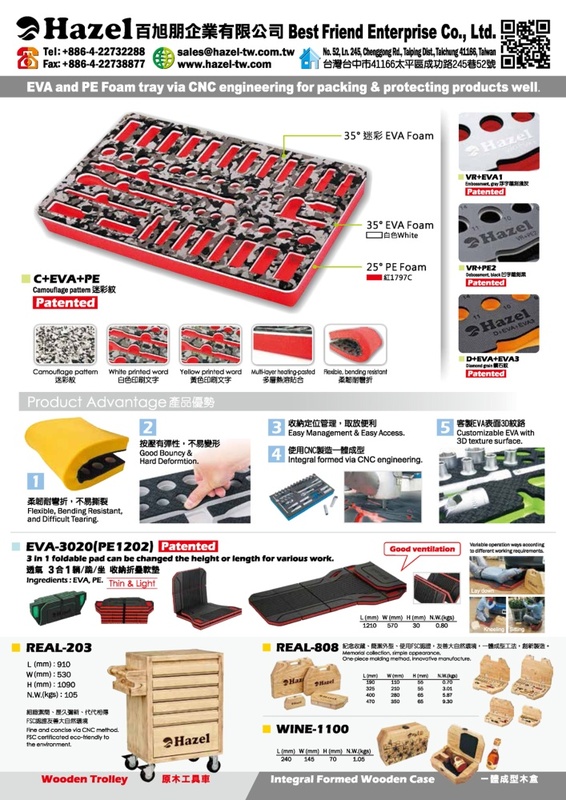 Design & Develop various kinds of PE and EVA FOAM (foaming) fixed cushion for hand-tools, protective soft pad, drawer pad inside of tool-cart. Various kinds of EVA and PE special-shape, irregular in shape suitable for electronics, precision instruments, hand tools, sports equipment, as well as all kinds of products fixed pad, cushion, soft pad, tool protection pad, anti-collision cushion, knee cushion, lying pad, work pad, can be maded according to your instructions. (1) EVA / PE / PU Foaming board. 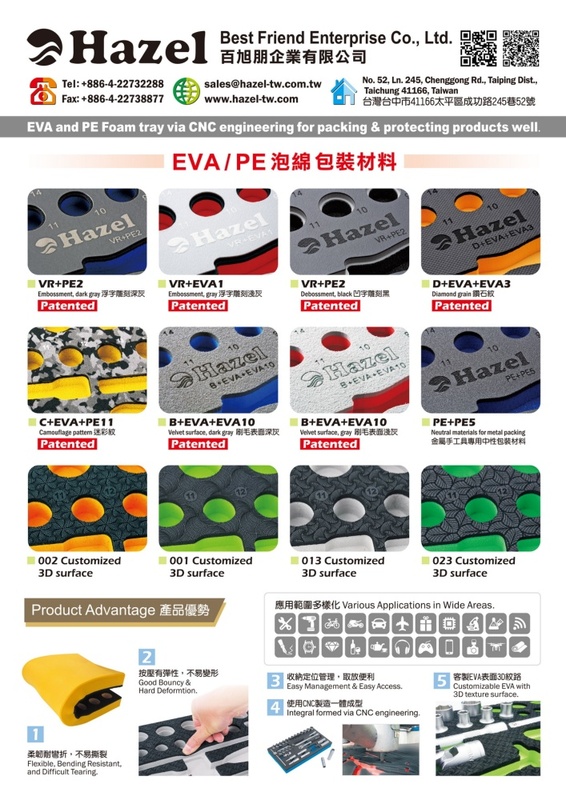 (2) EVA and PE Foam tray via CNC method for well packing and protecting tools / auto repairing equipment / precision products. (3 Patented products - 3 function in 1 foldable pad that can be changed the height or length for lying, kneeling, or sitting when you are doing various work. (6) Clever combinable mat & wall-sticker (Non-toxic, non-odor, Safe LDPE foam). 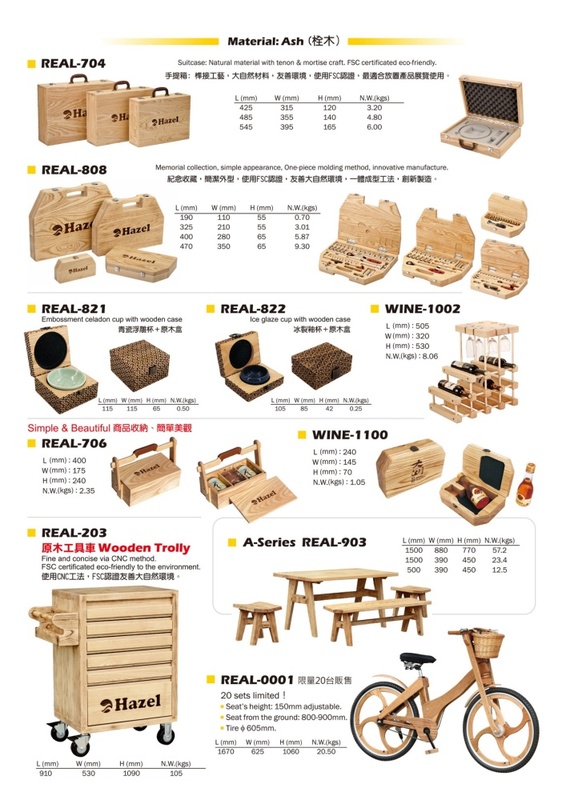 (7) Real wooden collection box for tools, product & souvenirs via CNC method. (8) Real wooden home furnishings via CNC method. (9) Real wooden trolley system via CNC method. => metal, wood, acrylic, EVA, EPE, PE, paper, plastic, glass, and mineral......etc. => wood, acrylic, EVA, EPE, PE, and paper......etc. Best Friend Enterprise Co., Ltd., keeps the principle of “To work well, must sharpen the tools first” to develop products in packaging and applications for hand tools, auto repairing equipment, or precision products.